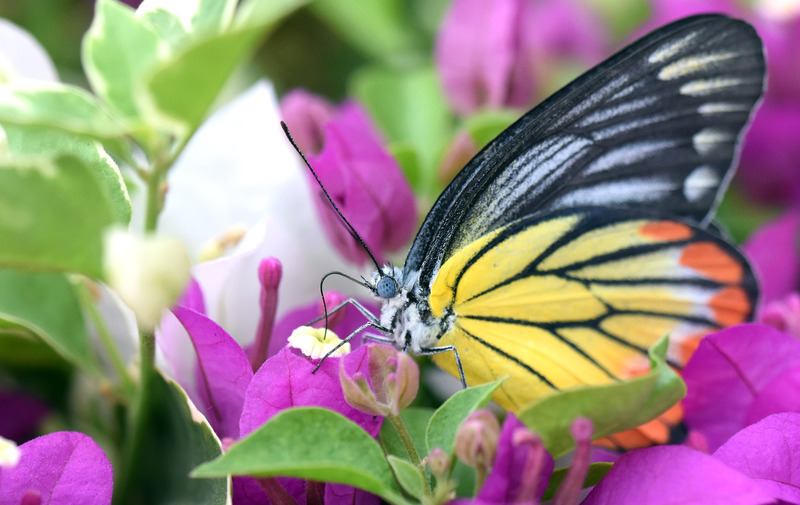 I spent some time observing and photographing Painted Jezebel (Delias hyparete indica) butterflies feeding and courting on Bougainvillea flowers in Thailand. These beautiful and very common butterflies are often seen flitting around the tops of trees, coming down to feed on flowering plants later in the day (1, 2). Their ubiquity does not detract from their beauty. The day was cloudy and overcast when I took these photographs and I did not use a flash, as I usually prefer natural lighting if I can get away with it. So some of the photographs of the butterflies in flight, are a bit blurred, but I have included them anyway to illustrate some of the behaviour exhibited by this species. Males and females of his species are quite easy to tell apart as the female has much darker, heavily black-dusted wings – particularly on the upper (dorsal) wing surface – than the male. 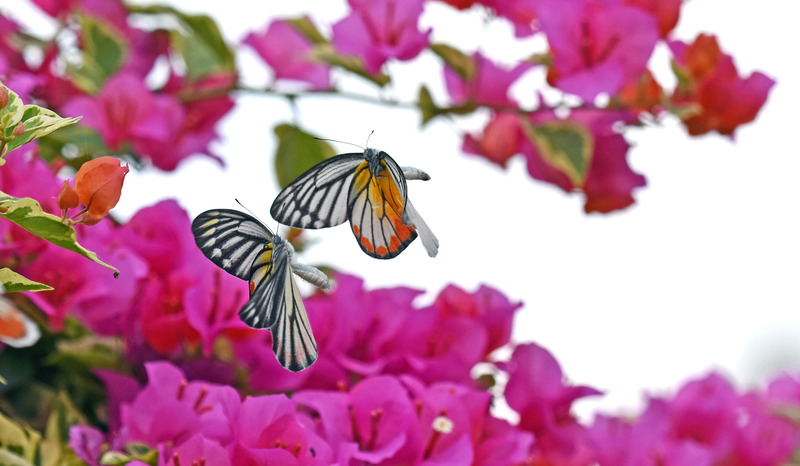 These butterflies are very active and fast-moving, but it is possible to observe some of the components of courtship behaviour, if you are prepared to follow them and walk round and round a bougainvillea bush! The males were very interested in females, and one, two or three males often chased after a female and followed her to where she was nectaring (feeding on nectar). 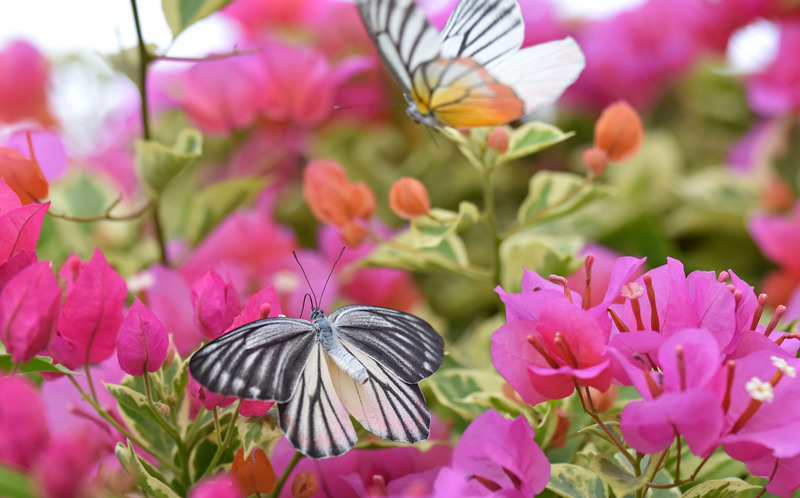 Vision is probably more important in the early stages of butterfly courtship; the male must first recognize the female – easy as the differences are marked in this species – and then court her to see if she is interested (termed ‘receptive’ in biology!). 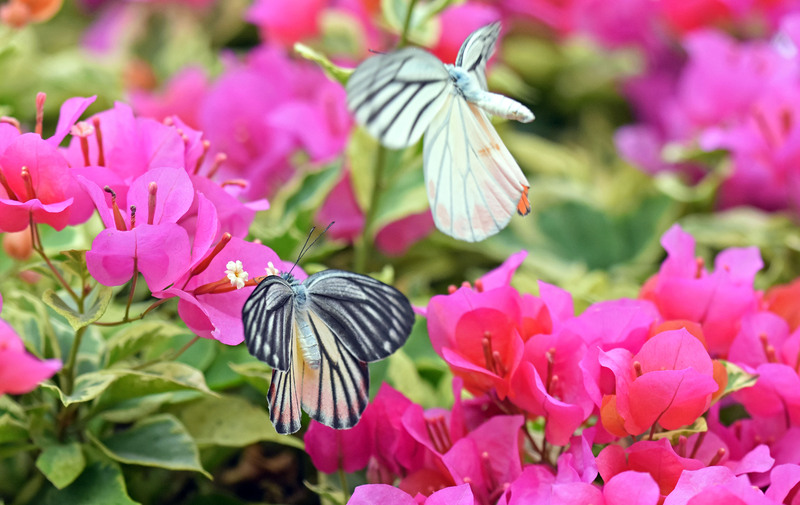 One researcher has described courtship behaviour by male butterflies: the male “barrages the female with visual, chemical and tactile stimuli by buffeting her with his wings or special scent-producing structures when flying near the female” (Rutowski, 1984). In other words, the males use a combination of touching and pheromone release to try and woo the females. 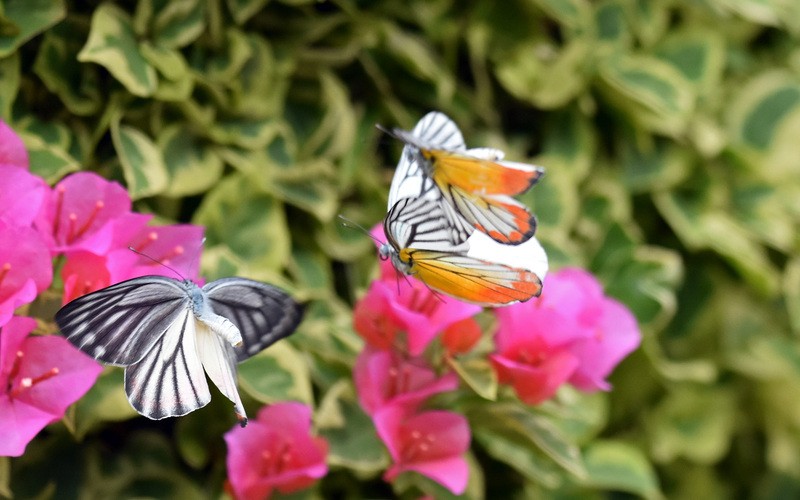 On the day I photographed these butterflies, none of the females appeared to be receptive for some reason – they may have already mated – and I did not observe any reproduction on this occasion. 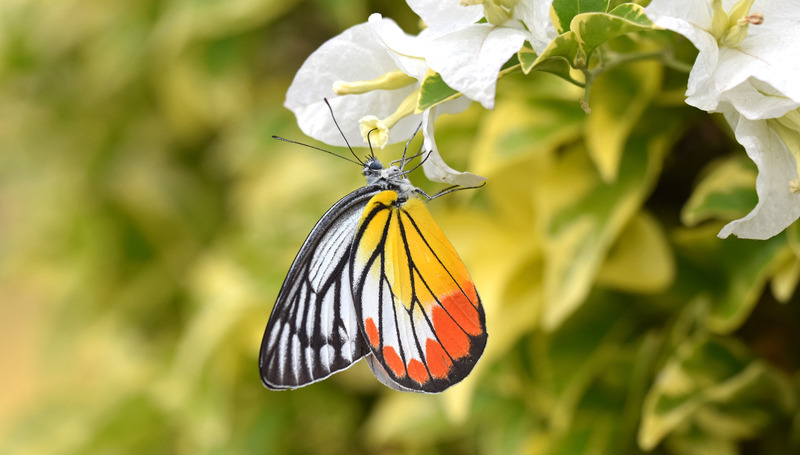 Female butterflies can almost always avoid the attentions of males, and thereby avoid mating, if they are not receptive (Forsberg & Wiklund, 1989). Indeed, some female butterflies have special ‘mate refusal postures’. 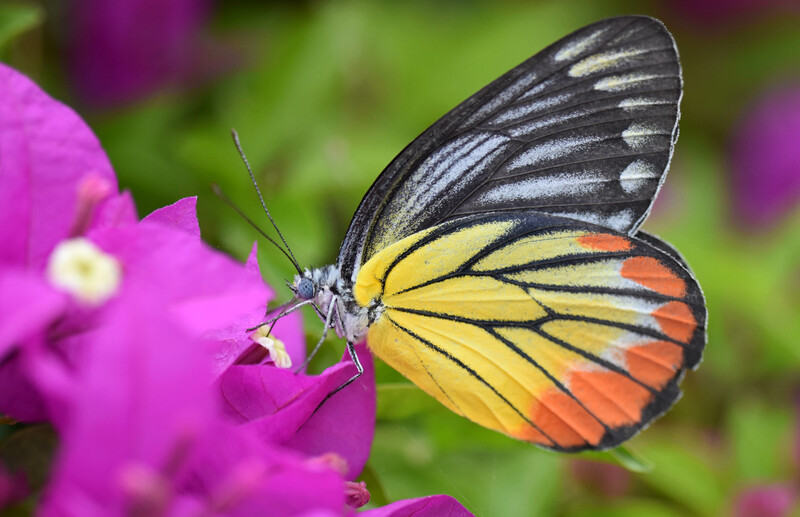 It is thought that in all pierid butterflies (including this species), the ‘mate-refusal’ posture is an elevated abdomen together with wings spread out as well (Obara, 1964). All of this happens very quickly, within seconds, but I think I might have caught a female raising her abdomen in the following photograph (below). I am not sure however, as butterflies also sometimes have this raised abdomen during flight. I don’t know how high the abdomen must be raised or whether it varies from species to species? I suppose the females who are not interested keep raising their abdomens until the male(s) desist and fly off! In contrast, is a lowered, or unelevated, abdomen a ‘come on’ sign in this family?! Another interesting behaviour to capture is nectaring. The butterflies move rapidly between individual flowers on a bush in a seemingly random manner (but it might not be!). The proboscis is carefully, but rapidly inserted into the corolla tube of the flower. The butterfly appears to press it further down into the flower as far as possible, until it’s head is right up against the opening of the corolla tube. There are tiny yellow anthers within the cream coloured corolla tube (just visible in the following photo) which the butterfly has to negotiate as it inserts its proboscis down towards the base of the corolla, where the nectar lies. Painted Jezebel (Delias hyparete indica) female with proboscis fully inserted. Flowers showing tiny yellow anthers. The proboscis is removed and curled up whilst the butterfly is in flight. Similarly, it is uncurled prior to arrival at the flower so it can be inserted immediately. 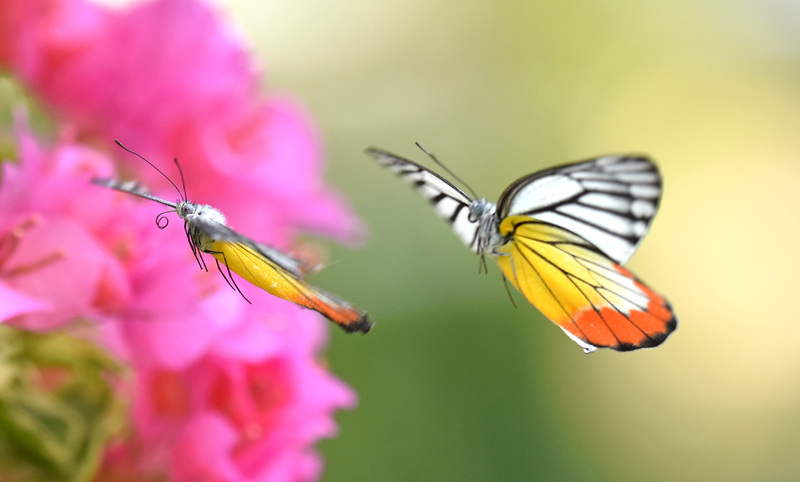 The butterfly on the left in the following photo (below) is starting to unfurl his – it is hard to say whether this is a male of female – proboscis in preparation for landing on a flower. The butterflies were moving rapidly between flowers, generally spending less than a few seconds on each flower but occasionally longer. Were these the ones with a good supply of nectar? There were a great many flowers to choose from; could they – like some bumblebee species can – tell whether a flower had been visited by another butterfly recently? I don’t know. I suspect not. 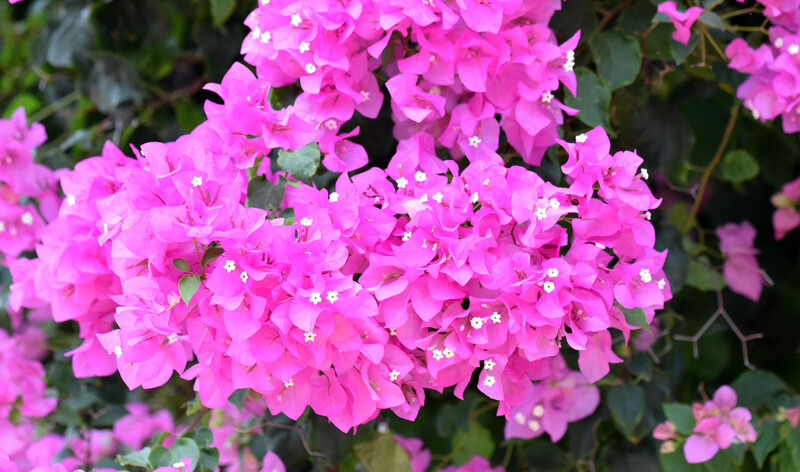 In which case, it was perhaps a matter of trial and error to search for a flower which had a good supply of nectar and had not been visited recently. Scope for a research project here! There was a definite sequence to the nectaring. The proboscis was inserted but at first retained a curved shape as it was pushed down into the tube of the corolla (see below). The butterfly carried on inserting the proboscis – and presumably searching for nectar – until the head of the butterfly was right up against the top of the corolla (see second photo below). This was as far as it could go. 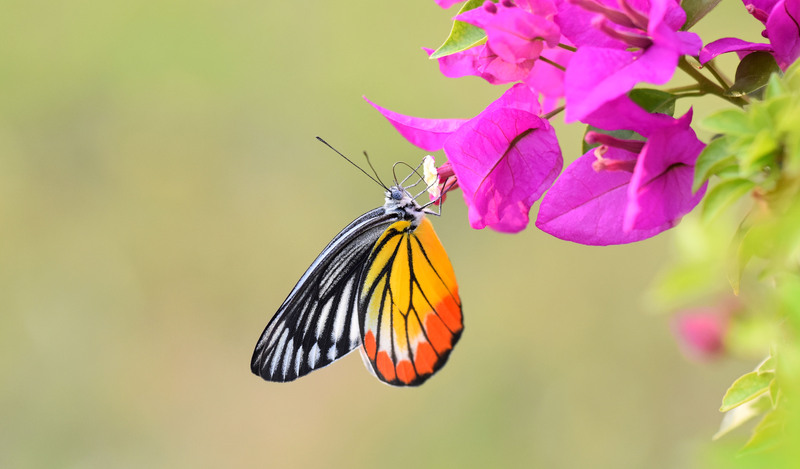 Butterflies usually visit flowers where they can easily reach the nectar (it would be a bit of a waste of time if the flower was too deep or the proboscis too long!). Lepidopteran proboscises vary enormously in length (from 1 to 50 mm) (4, 5) and species have evolved to feed on certain types of flower where the proboscis roughly matches the length of the corolla. But they are adaptable. Flowers and pollinators have evolved together. In the case of Man-bred hybrids such as these, it is just a matter of luck presumably whether butterflies have the right equipment to extract the nectar. These butterflies certainly did! 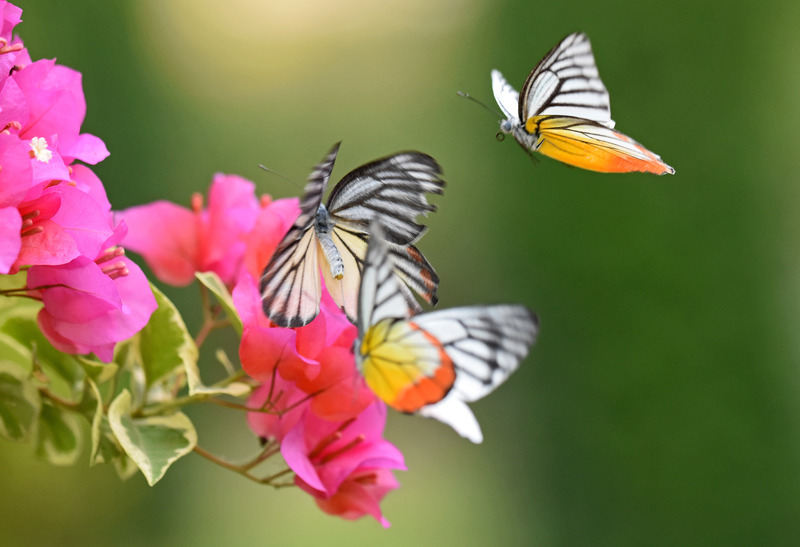 There is an enormous academic literature on the biology and ecology of butterflies, but there remains a surprising lack of detailed behavioural studies for some species. So there are great opportunities for amateurs to observe and record butterfly behaviour in the field. Concentrating on a common species such as this, it is possible to gain some insights into their lives. I hope that this account has shown that there is much to be learnt about butterflies and with patience and perseverance they secrets can be discovered! Rutowski, R. L. (1984). 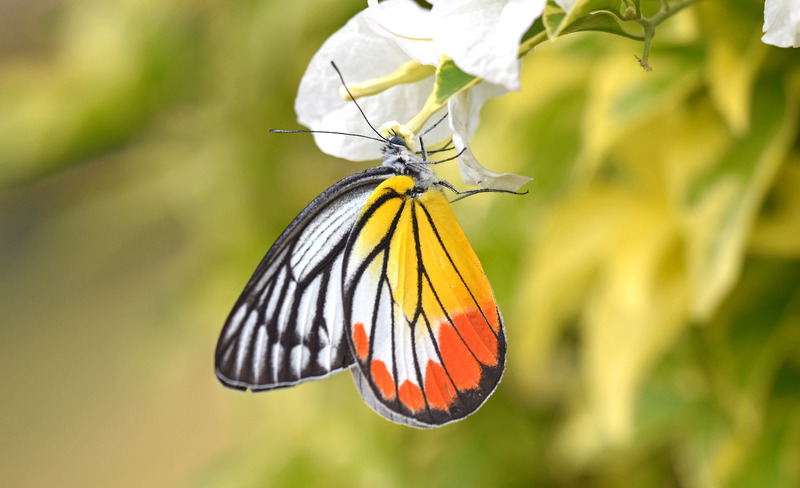 Sexual selection and the evolution of butterﬂy mating behaviour. J. Res. Lepid, 23, 125-142. Forsberg, J., & Wiklund, C. (1989). 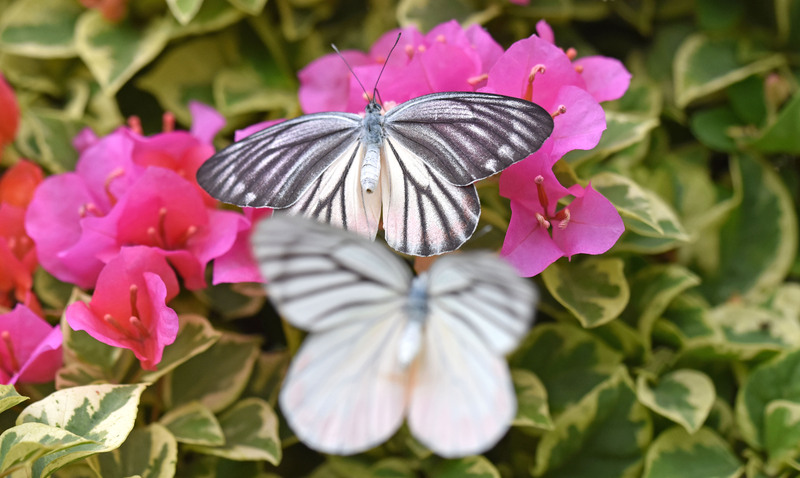 Mating in the afternoon: Time-saving in courtship and remating by females of a polyandrous butterfly Pieris napi L. Behavioral Ecology and Sociobiology, 25(5), 349-356. Obara, Y. (1964). Mating behaviour of the cabbage white, Pieris rapae crucivora II: the ‘mate-refusal’posture of the female. Zool. Mag, 73, 175-178. Monaenkova, D., Lehnert, M. S., Andrukh, T., Beard, C. E., Rubin, B., Tokarev, A., … & Kornev, K. G. (2011). 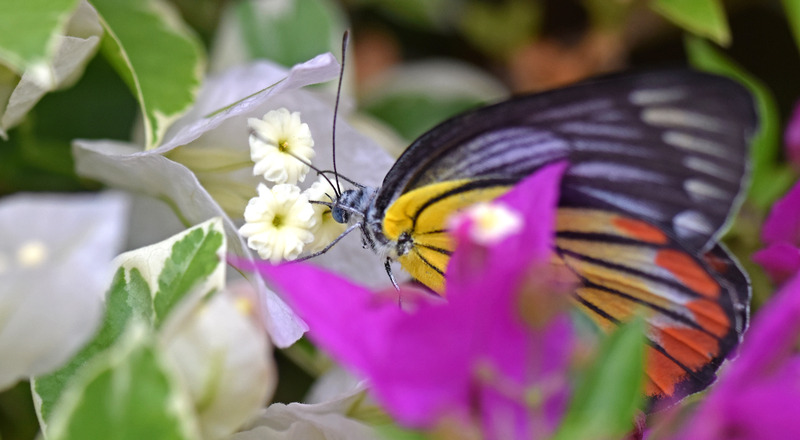 Butterfly proboscis: combining a drinking straw with a nanosponge facilitated diversification of feeding habits.Journal of the Royal Society Interface, rsif20110392.